When is a Pipe Not Worth Repairing? This morning I am asking that question because sitting on my work table is an old Tinderbox Monza, made in Italy by Lorenzo. This old pipe has definitely seen better days. The bowl is over an inch in diameter and the cake in the bowl had choked it down to the point that I could not get my little finger in the bowl. The rim looked as if the pipe had been used as a hammer to the point that it had a chunk out the rear outside edge and a crack that went down the outside of the bowl with a visible fissure across the top of the rim and beginning to drop into the inner rim. The top half of the bowl looked like someone had carved at the cake with a knife and done a poor job of it. Fortunately the cake was as hard as rock so it did not do too much damage to the bowl. All of those issues are not enough for me to pitch a pipe and not work on it. But the damage on this Monza did not stop there. The bottom of the bowl had been victimized by the self same knife wielder and he had carved over half of the bottom of the bowl away in his poor attempt at cake removal. The bottom of the bowl now flowed from the airway at a steep 30 degree angle with a jokerish gash along the front right bottom edge. At that point the bottom of the bowl is dangerously thin. You see the cake was all around the middle of the bowl like a girdle choking off the pipe but the top and bottom somehow had been miraculously purged of the cake by the knife wielding pipe abuser. This bottom of the bowl gives me pause – I could drill out the bottom of the bowl and insert a bowl plug or I could fill the bottom with a plaster of Paris fill to level it out and then coat the bottom with pipe mud. But would it be a waste of time? Would it be worth the effort? I am not done enumerating the damage on this old pipe. The exterior of the bowl, the finish was ravaged. The front edge of the bowl was worn down like the heel on a hard playing boy’s pair of shoes. The angle and extent of the damage covered the entire front of the bowl. The striated finish, which was meant to look like tree bark was totally filled in with grit and grime to the point that it was almost smooth. It felt sticky to the touch and the smell was atrocious. I am surprised that my bride let me have it in the house. The striations on the shank were as filled in as those on the bowl so the true shape of the pipe and its finish were absolutely hidden. But I am still not finished. The stem looked as if it was clean other than minimal oxidation… things were looking up. Maybe I would at least be able to cannibalize a stem out of this disaster. But no, it was not to be. I turned the stem over and it had a gaping hole – a chunk taken out of it that went back almost a half inch into the surface of the stem. The entire button was missing and the gap went from one side of the stem to the other – left to right. But that was not all of the damage to that poor stem – it looked as if the opening had been further opened with the self same knife. Yes the mad knife wielder had carved a slot into the airway at the bottom of the hole. The carving left the bottom of the airway paper thin. It looked as if after doing this “master” surgery the fellow had put a rubber bit protector on the stem as the calcification line on the stem was thick. Doing that after the surgery is like closing the door after the horses have left the barn! All of these wonderful discoveries met my eye as I examined the pipe before I even considered working on it. I took the pipe apart at this point in my examination and put on the rubber gloves to probe the internals. I was pretty concerned at what would greet me when I took off the stem – if it would come off at all. With the goop that was all over this pipe it was a fair chance that the stem was “welded” in place. But to my great surprise it twisted off quite easily – no drama in this process. I peered down the shank with a penlight to see what creatures and mayhem awaited me inside the shank. I fully expected to see the interior carved by the knife wielder as he sought to make the pipe work “better” after his surgical excavations. But I literally had the wind knocked out of me when I saw a pristine shank. The shank was actually clean! The wood had a veritable glow to it as the light reflected back to me. It was not only clean but there were no tars and oils in it. This totally did not match what the condition of the bowl and externals had led me to expect. What an anomaly. Why was this so? What was going on here? These were just a few of the questions that ran through my mind as I held the bowl, sans stem in my hand. With that discovery my thoughts regarding the fellow who had so drastically carved up this poor pipe and virtually ruined it took a turn. Rather than seeing him as some sadistically sick individual who took obvious evil delight in so ruining this old pipe to make it questionable if it could ever be restored; I began to soften in my assessment of him. I looked again at the externals of the pipe and stem. 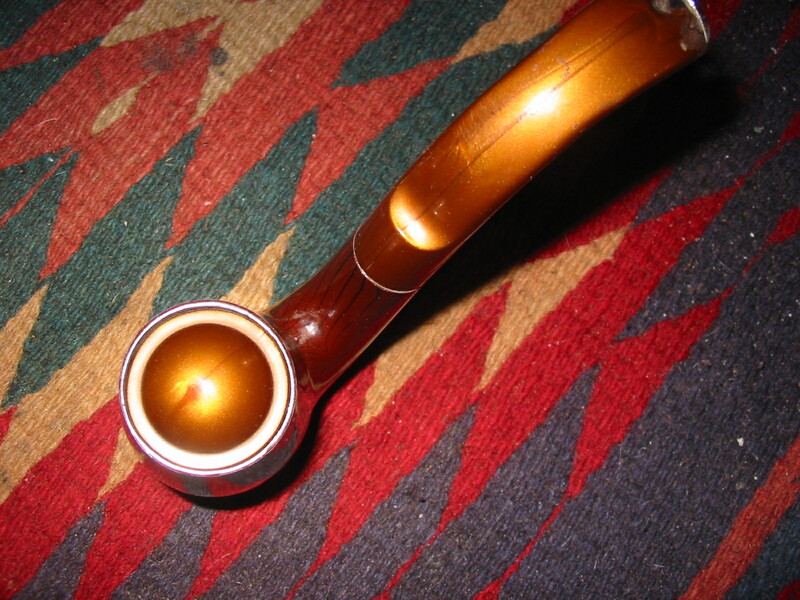 I looked at the carved and cracked bowl, the carved and ruined stem, the left over remnants of the rubber softie bit and I began to wonder if what was in my hands was the old pipe smoker’s favourite pipe. As it became harder and harder to smoke he took more drastic measures to make it last. Mind you they are not the same measures that you or I might take but they nonetheless obviously worked for him. Maybe rather than see the fellow as a pipe butcher I should see him as someone who loved this old pipe. He was going to smoke it until it truly gave up the ghost. I began to wonder if he was not of the old school of pipe smokers who had one pipe and smoked it literally to death and threw it away and started on a new one. This one must have been a grand smoker to have been put through the trauma that it showed in it body. You can see now the tact that my mind was taking me. 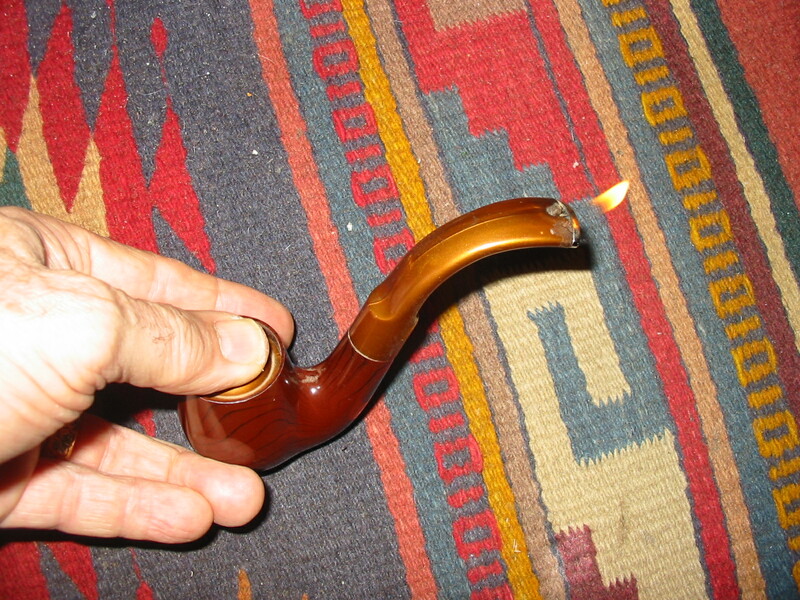 It would be inevitable that I clean up this old pipe – it would be an act of honouring the old briar and the old pipe smoker who had inflicted so much damage to just get the last bit of life out of his pipe. So it is with this in mind that I reamed the bowl, soaked it in an alcohol bath, scrubbed the finish with a wire brush and topped the bowl to begin the process of bringing it back to life. I have it sitting on my desk next to me now – I will need to fit a new stem on it and then refinish the bowl but it will once again deliver at least one smoke for me to explore my new theory. So you might ask me, “When is a pipe not worth repairing?” I honestly don’t know the answer to that question. Even an hour ago I would have said this one was a goner. But now, I have “heard” the story of the pipe as I examined it looking at all of the abuse that had been inflicted on it. Now I see with different eyes. You see, that is the problem with pipe refurbishing. When others see a pipe as irreparable there is something that catches my eye that says to give it a try. 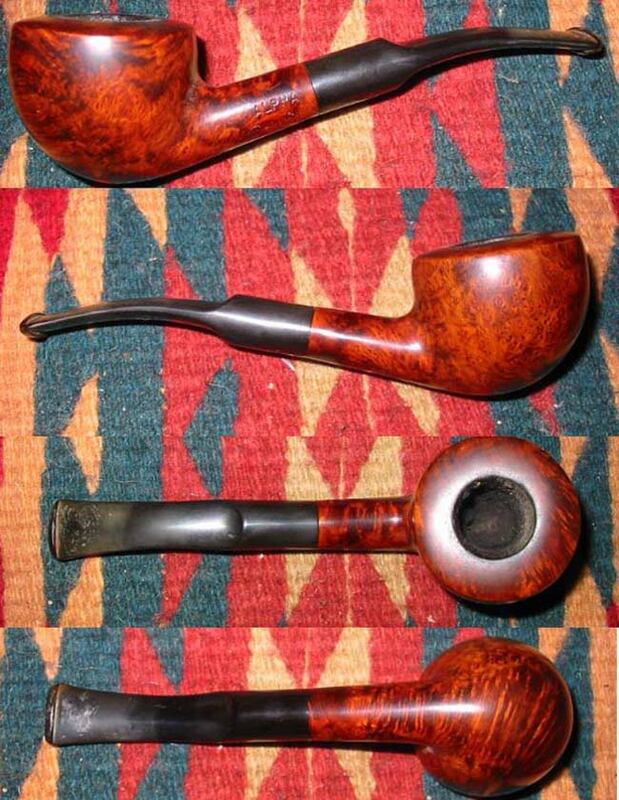 I guess I have only met a very few pipes that were so damaged that they could not be brought back to life for a new season. And to be honest I still have several of them in my cupboard “seasoning”. I guess I truly don’t know the answer to the question I posed in the title. 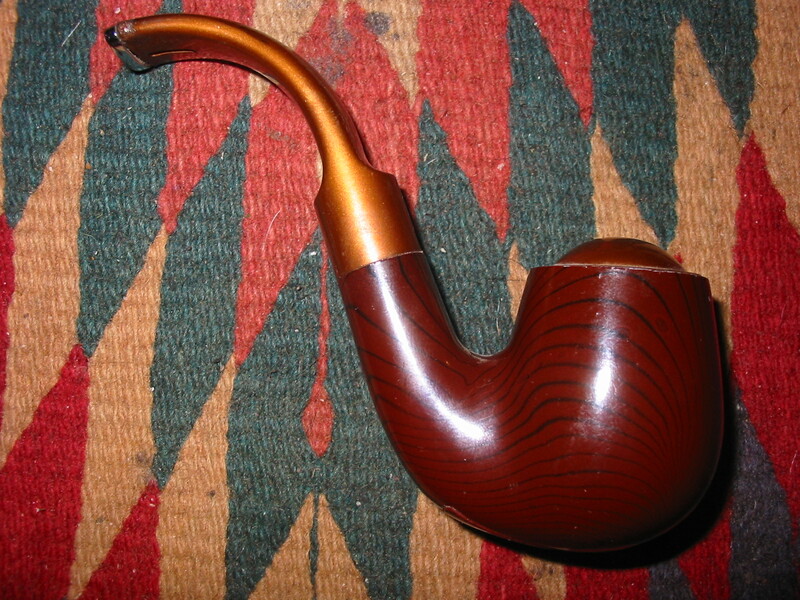 This entry was posted in Pipe Related Essays and tagged Pipe related essay, refurbishing essay, when is a pipe beyond repair on February 10, 2014 by rebornpipes. We talked during that lunch hour about the kind of tobacco I smoked and the pipes I had. I told him I had only smoked the tobaccos I had purchased through drugstores, grocery stores and convenience stores. That limited the tobacs to Sail, Borkum Riff, Velvet, Half and Half, Sir Walter Raleigh, Prince Albert and Mixture 79. He laughed and said I had not really smoked anything that he would consider worth the time. They were staple tobaccos but I needed to try something of better quality and fuller flavour. He introduced me to some of the better bulk tobaccos that he had available and gave me some sample of Virginia and Virginia and Perique blends to try. I was hooked and quickly quit buying the Borkum Riff. I also tried a nice toasted Cavendish that became my go to blend for quite a while. I showed him my little Medico Brylon billiard and I have to give him credit, he did not mock it or laugh when he saw it. He asked me some questions about whether it burned hot or wet. He talked about caring for the pipe and keeping it clean. He showed me how to pack the pipe and tamp it. All things I had learned before but things he wanted to make sure I understood. After all of that he introduced me to the world of estate pipes. He had a display case filled with a wide range of pipes of all brands and shapes. I wish I knew then what I have learned since because I remember that the pipes he had were well maintained and restored. I went through many of them and in the course of our conversation he talked about how briar would smoke better than the Brylon I currently smoked. He asked me a price range of pipes I might be interested in. I was not sure so I gave the price as $25-40 would work for me. After all I had spent $5.95 on the Medico. He again did not laugh or shake his head in disbelief. Rather he put about 6 different pipes on the top of the display case for me to look at in that range. He walked me through the information on each pipe and showed me the condition of them and any issues that they may have had. He said I would need at least two pipes in order to give ample time for them to rest between smokes/days. Added to the little Medico that would give me a rotation of three pipes and that was a good start. I sorted through the lot that he had put up for me to look at and chose two pipes. 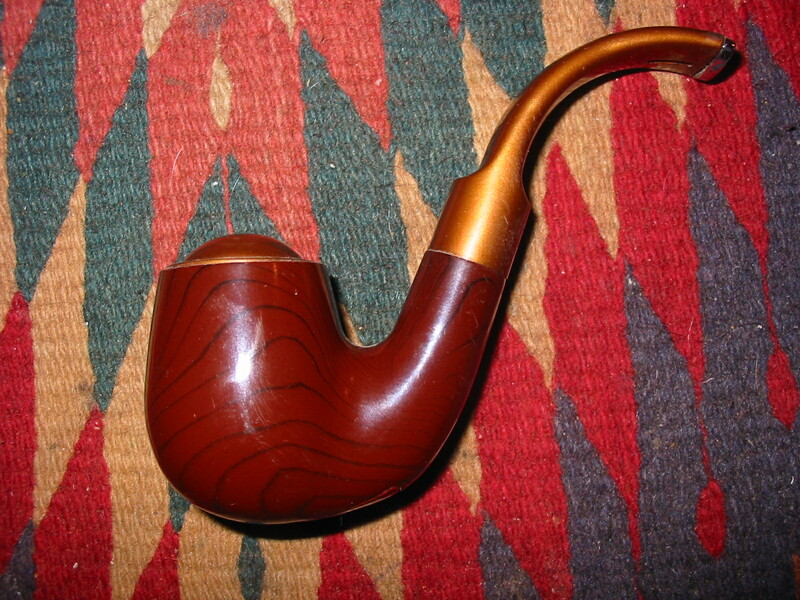 The first was a Ben Wade – Preben Holm freehand. It had a great blast finish and felt really good in the hand. It was broken in well but Bill had reamed the cake back to a thin coating on the bowl. The stem was buffed to a shiny polish and the pipe truly looked new to me. The plateau top was great and I loved the look of it. The second one was a little Alpha, Israeli made pipe that had a more classic look to it. I am not sure of the shape of it to this day. The stem was a simple saddle bit with a denture stem on it. That is where the name Alpha Comfit came from. This was also very clean and ready to smoke. (I have since had the stem replaced. I sent out to Lee Von Erck in Northern Michigan, USA and he did the stem for me about 15 or more years ago). Both of these pipes are still in my collection and have provided many years of fine smoking pleasure for me. They have darkened over the years and have a nice patina to them now. They are pipes that I frequently pick up in my rotation because they always deliver. The photos above show the two pipes as they are today. I should polish and buff the stems a bit to remove the tooth chatter and oxidation. 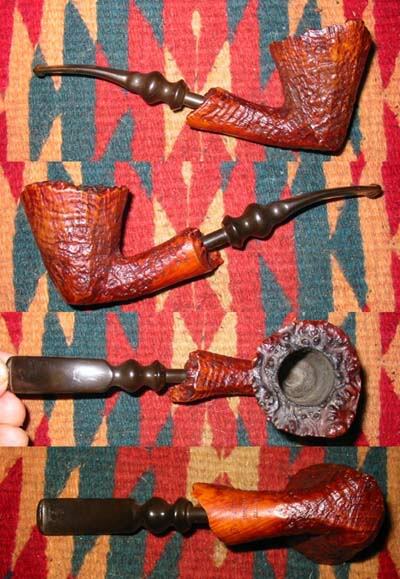 This entry was posted in Pipe Related Essays and tagged Alpha Comfit, Alpha Israel, Alpha Pipes, Ben Wade Freehand, Ben Wade Pipes, Pipe related essay, Pipe related topic on March 21, 2013 by rebornpipes.